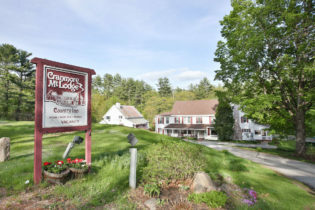 Elegant Country Inn on 5 secluded acres offering peace and tranquility yet just steps away from the heart of North Conway Village offering so many beautiful shops and fine dining. 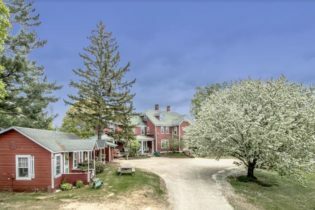 Elegant Country Inn on 5 secluded acres offering peace and tranquility yet just steps away from the heart of North Conway Village offering so many beautiful shops and fine dining. Also, just down the street from Mount Cranmore. It features 10 tastefully appointed guest rooms with private baths, spacious guest living room with fireplace, a beautiful dining room and an additional great living room where guest can play games, watch TV or just relax in front of the fireplace. The owner’s living space is incredible with a large living room, fireplace, a marvelous kitchen, three bedrooms and a full bath completes this special area. The grounds are very well maintained. There is an in ground pool and a trail to Mount Surprise. This unique inn is a Member of Select Registry which means this is a truly special Inn! Successful country Inn, with strong business, featuring 20 uniquely decorated guest rooms, including four suites, two of them with kitchenettes, all with private bath and individual A/C. Excellent year round business in the heart of the Mount Washington Valley. Successful country Inn, with strong business, featuring 20 uniquely decorated guest rooms, including four suites, two of them with kitchenettes, all with private bath and individual A/C. Gorgeous guest dining room overlooking the peaceful backyard and the pond, two spacious guest living rooms, one of them with a fireplace. Large kitchen with commercial equipment. The owner’s quarters consists of two bedrooms, living/dining room, kitchen, a large deck, and it offers privacy. The 5.7 acre lot is absolutely beautiful, with about 600 feet of frontage on Abbott Brook and a nice pond on site. The Cranmore Mountain Lodge was built in the mid-1800’s, and began operating as an Inn during the 1890s. Throughout its long history, a number of families owned the property, and many children grew up in the Inn. Notably, Babe Ruth’s daughter, Julia Ruth Flanders Stevens and her husband Richard Flanders owned the inn from 1940 – 1950. The location is one of the best! So close to the center of North Conway Village offering a variety of quaint shops, and very good restaurants, and in the heart of the Mount Washington Valley a natural playground for everyone! Strong year around business! Located three miles from beautiful Lake Winnipesaukee and downtown Meredith, NH, this historic B&B was built as a colonial homestead circa 1763 and expanded in 1802 to become the oldest inn in the Lakes Region. The inn is close to ski areas and hiking in New Hampshire’s White Mountains as well as to water activities. Summer entertainment close by includes live theater and concert venues. The main part of the inn features all of the original woodwork including hand hewn exposed beams, wide plank flooring, pine plank walls and five working fireplaces, two of which are in guest bedrooms. There are 10 fully furnished guest rooms, each with en suite baths. Two of the ten rooms are suites with separate entrances and kitchen facilities: The Nutmeg Suite is situated at the back of the main inn and the Sugar Shack is a separate two-story cottage formerly a maple syrup sugaring house in the early 1800’s. The common area for guest enjoyment is uncommonly large for a bed and breakfast and includes a large sitting/dining area, dining room, TV/game parlor, and a large room currently used as a billiard room. 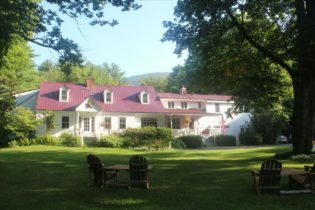 The inn sits on 7.5 acres of mostly wooded land and the inn is surrounded by mature gardens, a heated, salt water swimming pool and large cedar deck. Modern improvements include a state-of-the-art, all copper fire sprinkler system and commercial septic system installed in 2013. Separate owner accommodations include a large master bedroom, dressing room and master bathroom on the first floor and two additional bedrooms and a bathroom upstairs. Kitchen facilities are large (approximately 16 ft. x 49 ft.) and include two stoves, two dishwashers, commercial refrigerator, two double sinks and a vegetable sink along with ample cabinet and pantry storage. On site laundry facilities include 2 heavy duty washers and dryers. This inn has established a reputation for superior service and accommodation as evidenced by Trip Advisor Awards of Excellence for each year of its operation. LOCATION! LOCATION! LOCATION! 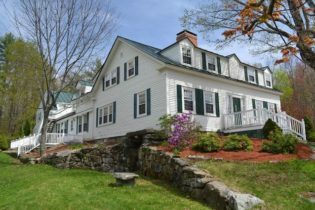 Beautiful Bed and Breakfast located in the heart of quaint North Conway Village. Five well-appointed guest rooms with private baths are in the main house, together with a spacious dining room and a very comfortable living room with a wood stove. Beautiful Bed and Breakfast located in the heart of quaint North Conway Village, just steps away from charming shops, great restaurants, and a very short drive to the major ski resorts; as well as all the amenities offered by the Mount Washington Valley such as hiking, swimming, climbing, biking, fishing and more. . The main building was built in 1810. It has been updated through the years, but still features beautiful exposed beams. Five well-appointed guest rooms with private baths are in the main house, together with a spacious dining room and a very comfortable living room with a wood stove. The private owner’s quarter is also located in the main house. Additionally, there are two rooms available for future expansion. There are 10 year-round cottages which were built in 1930. They are adorable! They offer comfortably rustic accommodations which give the guests a complete feeling of mountain living. The cottages feature either one or two bedrooms, some also have kitchenettes, a living area and a porch. The cottages make this B&B very unique, in fact this is the only B&B in North Conway Village offering this type of accommodation. This B&B is very successful. If you are ready to become an innkeeper, here is your opportunity! Main house features five guest rooms, all with private bathrooms . Main house has two additional rooms, great for future expansion. Ten cottages include six one bedroom units and four two bedroom units. Some cottages feature a kitchenette, a living area, and porch. Private owners quarters In-ground pool. Set in the heart of the Mount Washington Valley, giving guests easy walking access to North Conway Village shops and restaurants. Central location provides quick access to ski mountains, hiking, fishing and swimming. Successful turn-key business Unique property is the only Bed & Breakfast within North Conway Village to offer cottages as well.